UXBRIDGE, Mass. (CNS) — After Todd Smith’s mother died, he took care of other elders. After they died, he was left homeless. A piece of bread — and the bread of life — changed him. Smith, 55, tells this story of his life, with help from other St. Mary Church parishioners in Uxbridge. He and his father took care of his mother when she had cancer. She died in 2001 at age 65. 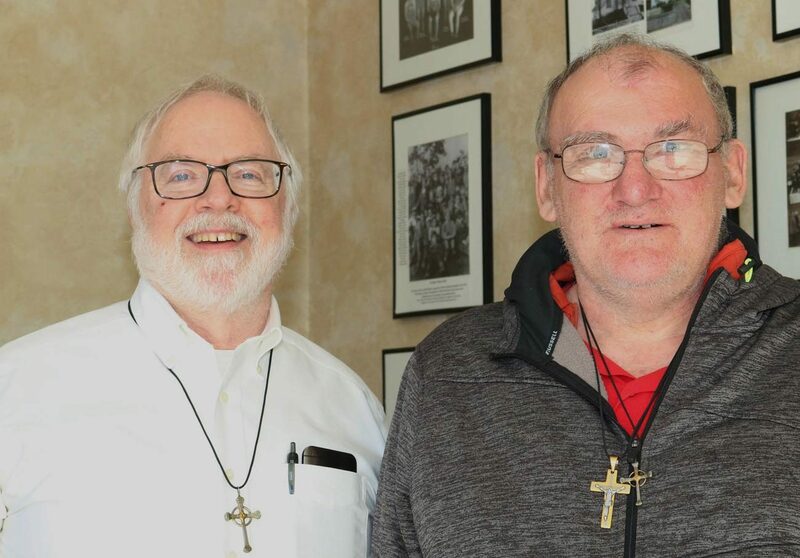 Between then and now his life has been changed by the Rite of Christian Initiation of Adults and the Light of the World evangelization program of the Diocese of Worcester. Smith said that after his mother died, he became homeless. An elderly friend let him stay with her in exchange for taking care of her. He also took care of three other widows. After they died, he was homeless again. When he arrived at the People First Food Pantry Dec. 14, 2014, a worker there stuck out her hand — to shake his and give him some bread. “You got the bread of life,” Dwain Robbins, St. Mary’s RCIA coordinator, told him. Smith’s “angel” at the food pantry, who chooses to remain anonymous, did more than feed him. She and a Protestant minister helped Smith get a motel room. Others helped him obtain Social Security disability benefits, medical care and, eventually, an apartment. When Smith asked about area churches, the food pantry angel told him about St. Mary’s. So Smith met the pastor, Father Nicholas Desimone, who eventually helped him join the RCIA program. “I felt God in me; I was flying high,” Smith said of the night he became Catholic. “We had to hold you down,” Susan Leighton, St. Mary’s administrative assistant, reminded him. Leighton said Smith was very sick at the time. Parishioners were concerned he might not live to see the next Easter Vigil. They have stretched out the RCIA’s post-vigil mystagogy so he can better understand what he has learned. Mystagogy has its origins in Greek and means “to lead through the mysteries.” It is a period of accompaniment for new Catholics as they better understand what it means to participate in the sacramental mysteries. They taught him how to pray and study the Bible and he forced them to communicate the faith better, said Smith and fellow parishioners. Now Smith is drawing others to Christ and the Catholic Church, including his father. A couple of his siblings also joined the Catholic Church, and he is working on a couple others. Smith not only left the streets; he entered a family. St. Mary’s RCIA once was “very much a school model … more about information,” Robbins said. Now the program is more communal as candidates share their journeys. While it is not RCIA’s role to meet a person’s physical and emotional needs, the team did that with Smith. RCIA team member Denise Rogan said Smith spends holidays at parishioners’ homes, and Christmas gifts for him filled the church office. That community bond was strengthened with Smith’s participation in the Light of the World retreat and in a small faith-sharing group. Meanwhile, he’s spreading the light on earth. And not just at church. He tells of praying with people who’ve had health problems like his, including fellow residents at his apartment complex. He socializes there too. Is he trying to evangelize others? Connor is a staff writer for The Catholic Free Press, newspaper of the Diocese of Worcester.